The coscom® interface protocol has it's origin in the year 1992 and has been developed by h/p/cosmos® for safe, reliable and advanced communication, control and links between different h/p/cosmos ergometers like running machines, treadmills, bicycle ergometers, ladder ergometers etc., as well as control and monitoring equipment like PC, EMG, ECG, EKG, ergometry, ergospirometry, VO2max systems, metabolic carts, cardiopulmonary stress test systems, PFT, biomechanics and motion analysis systems, fitness and sports medical as well as lactate evaluation and analyzing software, etc. coscom v3 protocol which extends the functions of the existing coscom versions and defines a new communication model. From January 2019 please use coscom v4 for control of h/p/cosmos and relevant OEM treadmills. coscom v3 is still a very safe protocol and remains supported at this stage. However, coscom v4 has additional safety features (initial re-confirming of treadmill start, compulsory failsafe instead of optional, etc.) and includes basically all essential commands required for treadmill control. coscom v3 and coscom v4 are not fully compatible due to different structures. coscom v3 still remains active for updating treadmill MCU5 firmware and also for implementation of functions such as keyboard and LED simulations, MCU5 optional functions, etc. The support for all older coscom® files (including coscomekg.dll version 1.00 and coscom.dll version 1.2.9 and also including coscom v2) ended on 31.12.2010 as announced earlier in 2010. Please upgrade in time to the new coscom v3 .NET Objects and coscom v3 .NET Controls or better to the latest coscom v4. Please note also, that the older versions of coscom v1 and coscom v2 are not designed and not documented based on IEC 62304 (Medical device software - Software life cycle processes) and ISO 14971 (Medical devices - Application of risk management to medical devices). Therefore from March 21, 2010 it is obligatory to upgrade to h/p/cosmos coscom v3 or coscom v4 in order to stay compatible with the latest norms, latest safety standards and Regulatory Affair Issues when connecting to h/p/cosmos medical treadmills. coscom v1 and coscom v2 will be deleted automatically from the MicroControllerUnits MCU5 during the next Firmware Update of the treadmill. MCU6 never included coscom v1, v2 or v3. MCU4 controllers (build from 1997 until 2007) cannot be updated but can be upgraded with MCU5 including coscom v3 and coscom v4. For MCU1, MCU2 and MCU3 controller in UserTerminals (build from 1988 until 2001) no updates or upgrades are available. Safety warning from February 8, 2019! In the very old coscom v1 and coscom v2 interface protocols the command of a negative speed (e.g. -0.5 km/h) can lead to unwanted acceleration. Do not send negative speed commands via RS232 interface when working with coscom v1 or coscom v2. Upgrade to coscom v3 or coscom v4 as soon as possible! h/p/cosmos only approves the interface protocol coscom® v3 and coscom® v4 for medical applications and herewith confirms the -since March 21, 2010 (MDD 93/42/EEC / Directive 2007/47/EC) mandatory- conformity of coscom v3 and coscom v4 according to the norms IEC 62304 (Life Cycle Requirements for Medical Device Software; Medical Device Software Life Cycle Processes) and ISO 14971 (Medical devices - Application of risk management to medical devices) as well as the compliance to a very high safety standard. All other interface protocols (older versions coscom v2, coscom v1, coscomekg.dll, other treadmill emulations, etc.) are not validated by h/p/cosmos according to the norms IEC 62304 and ISO 14971 and must not be used for medical applications (e.g. ergometry, stress-tests, cardiorespiratory diagnostic, performance diagnostic, etc.) since March 21, 2010 in connection with h/p/cosmos treadmills or h/p/cosmos OEM treadmills! h/p/cosmos gibt nur das Schnittstellenprotokoll coscom® v3 und coscom® v4 für medizinische Anwendungen frei und bestätigt die -seit dem 21.03.2010 (MDD 93/42/EWG / EU-Änderungsrichtlinie 2007/47/EG) vorgeschriebene- Konformität von coscom v3 und coscom v4 nach den Normen IEC 62304 (Medizingeräte-Software; Software-Lebenszyklus-Prozesse) und ISO 14971 (Medizinprodukte - Anwendung des Risikomanagements auf Medizinprodukte) sowie die Einhaltung eines sehr hohen Sicherheitsstandards. Alle anderen Schnittstellenprotokolle (ältere Versionen coscom v2, coscom v1, coscomekg.dll, andere Laufband Emulationen, etc.) sind von h/p/cosmos nicht nach den Normen IEC 62304 und ISO 14971 validiert und dürfen für medizinische Applikationen (z.B. Ergometrien, Stress-Tests, kardiorespiratorische Diagnostik, Leistungsdiagnostik, etc.) seit dem 21.03.2010 nicht mehr in Verbindung mit h/p/cosmos Laufbändern oder h/p/cosmos OEM Laufbändern verwendet werden! The following manufacturers have implemented the h/p/cosmos® coscom® protocol and/or the coscom.dll into their devices and / or software. Not all below listed manufacturers have implemented "coscom v3" or "coscom v4" yet, and so not all devices are compatible yet based on latest MDD requirements and DIN EN / IEC 62304. For a final re-confirmation concerning compatibility through coscom v3 or coscom v4 please contact service[@]h-p-cosmos.com and the respective manufacturer of the host device. Contact service[@]h-p-cosmos.com for further details about the device models and software versions. The coscom from version 2.03.1 and higher is also designed for communication with and control of bicycle ergometers. h/p/cosmos® undertakes utmost efforts in providing compatibility to the existing coscom protocol, even if there were updates for improvements and additions to the coscom protocol in future. h/p/cosmos always focuses on downward compatibility of the coscom protocol. In 2008 h/p/cosmos introduced a new coscom version called v3. This version introduced several new features and a new communication model which stays abreast of changes in modern software development. coscom v3 is actually not compatible with older versions but further versions will be downward compatible with this version. In Autumn 2017 the new coscom v4 has been introduced and offers simplified solutions for remote control of treadmills and ergometers. As a special support h/p/cosmos offers the h/p/cosmos coscom.dll file for fast and comfortable implementation of the h/p/cosmos coscom v1 and v2 protocol into devices and software. The support for this v1 and v2 dll will end on 31.12.2010. Please upgrade existing software to the new coscom v3 .NET Objects and Controls. As a special support h/p/cosmos offers a set of Microsoft .NET libraries, the so called h/p/cosmos coscom v3 .NET Objects, for fast and comfortable implementation of the new h/p/cosmos coscom v3 protocol into devices and software. For creating GUI graphical user interfaces, h/p/cosmos offers the so called h/p/cosmos coscom v3 .NET Controls. This set of Microsoft .NET Libraries is designed for fast and comfortable integration of some coscom v3 features into the graphical user interfaces of your software. All of us (manufacturers, R & D software programmers, service engineers, etc.) have the potential of improving the coscom protocol when dealing with these issues during development and service issues. Any suggestions to improve the coscom protocol are welcome at any time and will be evaluated for update in the next version quickly for the benefit of all parties involved. After implementation of the h/p/cosmos coscom protocol into devices and software, extended tests of the communication must be performed with detailed documentation for safety reasons. Send your device and/or software to h/p/cosmos with a complete description of the test routine and h/p/cosmos will do its utmost to assist in testing the interface communication and cross-check with your test results. As an alternative h/p/cosmos can offer a special hardware simulator (only the UserTerminal of a treadmill, a very handy device) at no charge for 4 weeks, in order to link the systems and to test the communication. Please make a documentation of the interface communication between your host device and the h/p/cosmos MCU simulator (for example use a data logger or data recorder) and send this protocol to h/p/cosmos for verification/validation and documentation process. This is obligatory also based on the latest norms (e.g. IEC EN 62304) and risk management. Contact service[@]hpcosmos.com for further details. Medical running machines (treadmills) are active medical devices (therapeutic devices and rehabilitation devices) of the risk class IIb. Always use IEC 60601-1 approved potential isolation components when linking medical devices via interface. If the equipment is used in the field of medicine, all connected devices and host equipment must be linked with potential equalization cables. First connect the potential equalization cable with the corresponding potential equalization plug pin (next to the main switch at the front of the h/p/cosmos device), then connect the entire medical system to the main potential equalization terminal of the medical room and then connect the mains voltage power plug of the medical system. 3. Any natural or legal person who sterilized, for the purpose of placing on the market, systems or procedure packs referred to in paragraph 2 or other CE-marked medical devices designed by their manufacturers to be sterilized before use, shall, at his choice, follow one of the procedures referred to in Annex IV, V or VI. The application of the abovementioned Annexes and the intervention of the notified body are limited to the aspects of the procedure relating to the obtaining of sterility. The person shall draw up a declaration stating that sterilization has been carried out in accordance with the manufacturer's instructions. Accessory equipment connected to the analog and digital interfaces must be certified according to the respective IEC standards, e.g. IEC 950 for data processing equipment and IEC 60601-1 for medical equipment. Furthermore all configurations shall comply with the valid version of the system standard IEC 60601-1-1. Everybody who connects additional equipment to the signal input port or signal output port or via any other linkage possibility, configures a medical system, and is therefore responsible that the system complies with the requirements of the valid version of the system standard IEC 60601-1-1. (MDD: 13.6.c, IEC 60601-1). When connecting medical devices to a medical system and/or when putting a company sign/logo/mark on a medical device, you become the manufacturer of this new device/system and you are responsible for CE-marking, technical documentation, risk management and all obligations based on MDD and the respective local laws and norms. E & OE. Subject to alterations without prior notice. h/p/cosmos is not liable for any damage and/or injuries arising from incompatibility or malfunction of host devices and/or software during controlling and communication between any of the systems, especially if no valid and implemented and signed quality assurance and regulatory affairs agreement exists. Copyright 1992 - 2019 h/p/cosmos sports & medical gmbh / Germany. Copyright, Disclaimer and Legal Notice. The implementation and use of the coscom protocol in other devices (not manufactured by h/p/cosmos) and in other software (not manufactured by h/p/cosmos) is only permitted, if h/p/cosmos sports & medical gmbh has agreed to the implementation and usage of coscom prior in writing and if the quality assurance and regulatory affairs agreement has been signed between the h/p/cosmos sports & medical gmbh and the other party and if this quality assurance and regulatory affairs agreement is fully implemented. coscom v3 and coscom v4 have been developed for the control of h/p/cosmos treadmills and other h/p/cosmos ergometers and other h/p/cosmos products and shall support manufacturers of ECG, ergospirometry and software manufacturer to utilize a safe and sophisticated interface protocol, which is maintained and updated according to latest regulatory affairs standards. As a contribution to h/p/cosmos' efforts for development and updating the coscom protocol and the coscom.dll, all users of the coscom protocol and coscom features who received the permission of use in writing, are obliged to list the name and company logo h/p/cosmos and the Copyright of h/p/cosmos in their software menu and their user/operation manual on a well visible position. In order to make your work easier and to help all service & sales engineers during installations please allow to make some suggestions according to our experiences and for future improvements. There are always discussions and queries how to find and select the right ergometer model. Following should be a simple and effective solution and a great menu on the ECG, Ergospirometry or PC for selecting the right ergometer type. 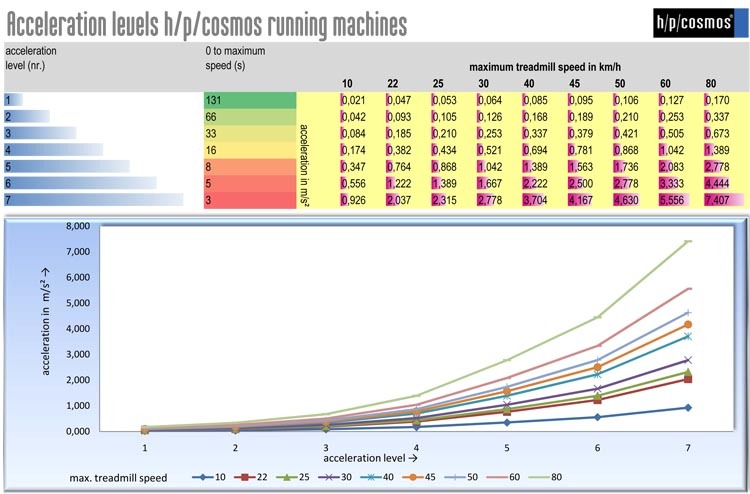 All of the below listed treadmill / ergometer types are made by h/p/cosmos and are equipped with the same RS232 interface protocol: h/p/cosmos coscom. Please do not list the different models (h/p/cosmos mercury med, h/p/cosmos pulsar, JAEGER LE 200CE, etc.) as all models have the same protocol. Furthermore we recommend to use treadmill symbols. h/p/cosmos provides true type fonts with legends and image files for the different models. Error simulation on failsafe function (timeout simulation of broken RS232 interface cable or PC failure or software crash) and with status communication of stop button pressed on the treadmill have to be made. If stop button was pressed on the treadmill, also the load protocol on the host PC-Software or system has to stop and must not continue to send speed or elevation commands automatically. Checksum and Acknowledgement have to be implemented in the interface protocol accordingly. Implementation of the SunTech Tango Blood Pressure Monitor in the h/p/cosmos coscom protocol. It would be great if your system offers to read the Blood Pressure Date via the h/p/cosmos coscom protocol and also offers to control the SunTech Tango system via the h/p/cosmos coscom protocol. Implementation of the "Acceleration and Deceleration levels" in the ECG or Ergospirometry or PC Software menu. This is a frequently asked question of the customers. Some of them are not happy if the treadmill speeds up slow, some of them are not happy if it speeds up very fast. All h/p/cosmos running machines offer an optional function where you can select a permanent acceleration level for all incoming speed commands via series interface RS232 h/p/cosmos coscom protocol. But it would be better and much more comfortable to have a menu in your system. Seven different acceleration levels and deceleration levels are available for all modes and for remote control via RS232. Max. Acceleration Level and minimum Acceleration Level see chapter: User Options / Optional Functions in the treadmill manual. If the existing acceleration levels don't meet your needs, coscom also offers the possibility to set the exact acceleration value in m/s. If the customer has a treadmill without UserTerminal Hardware: He can easily control the treadmill without starting the ECG or Ergospirometry Software by means of h/p/cosmos para control. If there are problems with the remote control of the treadmill it is easy to check if the problem is in the ECG / Ergospirometry or in the treadmill. 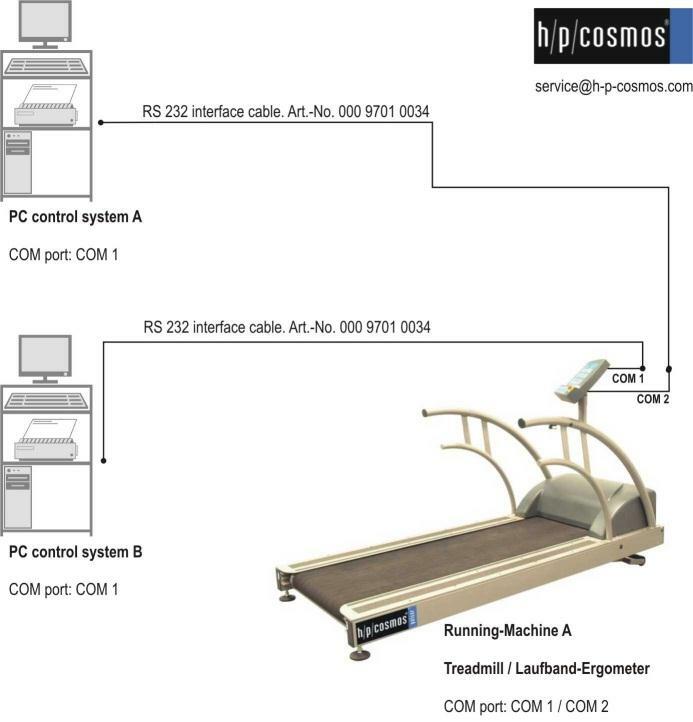 If the customer has a treadmill without UserTerminal Hardware: For Service and maintenance it is essential to have the h/p/cosmos para control, because otherwise it is not possible to use the optional functions of the treadmill. The ECG / Ergospirometry menu does not offer access to the optional functions of the treadmill. And last but not least, it would be great if in the ECG / Ergospirometry installation menu is included a Word or html file with a good instruction list (the right order, screen-shots, etc.) how to link the treadmill and how to select the right treadmill type on the ECG / Ergospirometry. A hardware simulator is available for perfect testing of the RS232 interface communication. And you can always send us your software for testing the communication. Ask for more details. To be used for example with h/p/cosmos para graphics, h/p/cosmos para control, PC ECGs, Ergospirometry Devices. For connecting your PC to the Running-Machine you need an interface cable (optional equipment) 9-pole Sub- D (male - female) with crossed transmission-receive-cable (PIN 2 and PIN 3). For control via USB interface an optional converter (USB-RS 232) is available at h/p/cosmos. For control via USB interface the processor on the PC must be Pentium 1.8 GHz or higher. The reason for that is: Many users control the treadmill via the RS232 interface (ECG, ergospirometry, PC-software, etc.) and an automatic load profile (for example BRUCE protocol). Then the user press the normal STOP button on the treadmill keyboard, since he had a treadmill with display and user terminal (cockpit). The treadmill stops and the customer thought he was safe. But then suddenly the treadmill speeds up again, because it received the next load signal (speed and elevation value) from the ergospirometry or ECG. It is of great importance to communicate via interface the "STOP-status" of the h/p/cosmos coscom protocol, in case the system was stopped on the treadmill keyboard and not on the stress test device (ergospirometry or ECG). The same risk can occur if the treadmill was stopped in any other way (treadmill power off, etc.) and the control device (ergospirometry or ECG) did not get or did not consider this information and continues to send speed or elevation commands via interface to the treadmill. Please consider the safety timeout (Failsafe) of the communication protocol. In case the interface connection will be terminated (e.g. the cable is cut or somebody pulls the RS232 interface plug or in case the PC OS has a malfunction), then the treadmill needs to stop automatically. You can use the acceleration level (acceleration index or exact acceleration value) for variations of speeding up or slowing down. A very useful an highly appreciated feature. To be in compliance with the latest safety standard, please send us your control software together with a complete description of test routine. This will allow h/p/cosmos to verify functions and safety. Also we can offer a special hardware treadmill simulator for testing the RS232 hardware connection. Ask for further details. (c) Copyright 1992 - 2017 Franz Harrer & h/p/cosmos sports & medical gmbh. coscom® and h/p/cosmos coscom® and h/p/cosmos® are registered trademarks of Franz Harrer and/or h/p/cosmos sports & medical gmbh.